Sweet Potato Pie Power Juice! This is an amazingly delicious juice that will energize your day and satisfy your tatse buds! 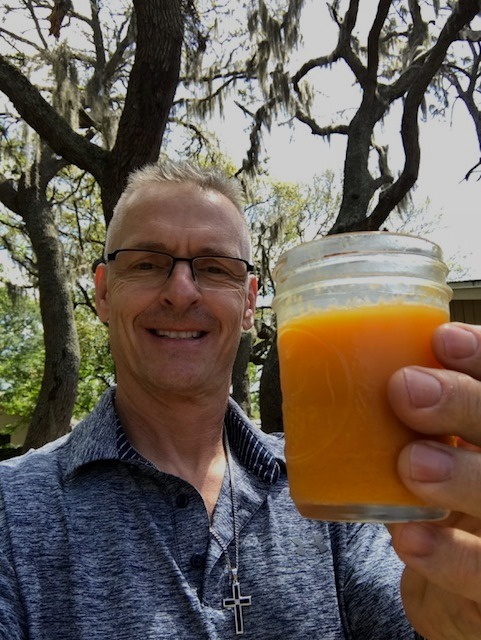 Sweet Potato Pie Power Juice by Coach Lew! 1-2 Drops of black pepper oil or a pinch or super fine ground organic black pepper. This helps to synergize the absorption of turmeric! Rinse all veggies and cut in to manageable sizes for your juicer. It is important to use a low speed masticating juicer to avoid over heating the juice and to protect the integrity of the nutrients and enzymes. Coach Lew recommends the Omega Vertical Juicer. Click here to order this amazing juicer on Amazon. Once you juice all the ingredients add one or two drops of Black Pepper Essential Oil and mix. Please make sure you are using an essential oil made for human consumption. You can tell becuase it will have the nutritonal facts label. The best way you can make sure to get a consumable oil is to order one from Doterra or get them directly from us at the studio! Consuming juice immediately after juicing is always best to get the most nutrition for it! You can store the juice refrigerated for up to 2 additional days. I strongly suggest storing juice in glass mason jars rather than plastic containers! Click here to order Black Pepper Oil or any other amazing essential oils! A note from Coach Lew..